We are excited to share some of the outcomes that have contributed to our award-winning culture and engagement. Our scientifically-validated research is the basis of everything we do and we hope these snapshots inspire you to continue your journey of building a Talent-Based Organization ® built upon The Science of Talent ®. 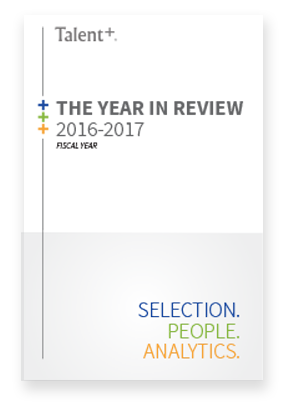 Simply fill out the short form to the right and you will receive an email with your copy of the Talent Plus 2016-2017 Year in Review.